The information presented here is obtained from the book "Tales From the Trees" published in 1981 by Ailene Hayes Schneider, a Minonk native. Minonk's orgins are tied to the development of the railroads in Illinois during the 19th century. In 1854 the Illinois Central Railroad completed its main line through Section Seven where the city of Minonk would eventually be located. On November 7, 1854 a plat of the town was recorded in the Office of the Recorder of Woodford County. The naming of the town is generally credited to David Neal, an agent for the railroad, who supposedly chose the name of a street in Boston, Massachusetts, on which he owned property. Another version is that he got the name from the Ojibwa Indians in which the word Minonk means "good place". One of the first settlers in Minonk was Joseph Stonier who arrived in Minonk in the early 1850's to help build the railroad here. He boarded at the Jonathan Macey house, which was located on the present Oak Street on the site now occupied by the VFW hall. It is assumed to be the first building in Minonk and the Jonathan Macey family was the first family in Minonk. Eventually, Mr. Stonier bought farmland south of the present city border. Stonier married Nancy Jane Macey, daughter of the owner of the boarding house in which he stayed. They had 9 children. In 1889 he founded the Minonk Eagle Brick and Tile Works. He died in 1903. Descendants of the Stonier-Macey family reside in Minonk yet today. They include Jeff, Eric and Craig Meyer, sons of Barbara Morrison (deceased) and the descendants of John Ryan IV and John Ryan V.
The picture to the left is looking north on Oak Street from Fifth Street around the turn of the century. The first settlement made in Minonk Township was identical with the first settlement in the present city and was made by Samuel Work, a native of Pennsylvania, he locating there in 1831. The Illinois Central railroad was completed to this point in 1854, and Mr. Work was appointed station agent. He was the first justice of the peace in the township, and at a time when Panola was included in the precinct. On November 7, 1854, a plat of the village was recorded in the circuit clerk's office. Then the area was 780 feet on each side of the railroad and extending 3,690 feet north and south. Peter Folsom, deputy surveyor in this county, surveyed the plat from Section 7, owned by David A. Neal at that time. That fall, Charles Dobson moved from Pattonsburg, and started a store, with Work and Jackson Parker. They built the first house in the township on the corner now the site of the banking house of Jenkins, Dunn & Co. In the following December a post office was established here, and Mr. Dobson was Minonk's first postmaster. C. W. Goodrich located in Minonk the following May and erected the second dwelling house. James Parker and his son, Martin were the next arrivals and from that time dates the rapid development of the village as many settlers arrived here that fall and winter. 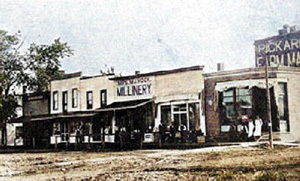 John Masey of Indiana, open the first hotel; Samuel Wiley of Minonk, broke the first farmland; H. A. Christians, a native of Germany, started the first blacksmith shop; Isaac Garrison was the first physician to locate here. The first death in the township occurred in the family of Thornton Taylor, his brother, La Fayette, died from an injury received from falling from a seat on which he was standing, at a meeting of some kind. Clara, the daughter of Mr. Christians, above named, was the first child born in Minonk. A school was established in the winter of 1856-1857, Frances Reeder in charge. Rev. Frost, a Presbyterian, was the first minister here. The first marriage was that of George W. Simpkins to Miss Mary Sutton, and was performed in the warehouse of Mr. Goodrich, in a part of which Miss Mary's parents lived. Justice Work performed the ceremony. In 1857, the township was organized as a separate precinct and at the election held April 7, the poll numbered 22. At this time, the first supervisor in the person of George P. Danforth, was elected. The town was not incorporated until 1864. The election for the five trustees was held September 30th, when R. P. Bell, A. Cholwell, C. W. Goodrich, H. C. Dent and M. A. Cushing were elected. Mr. Bell was selected from the number as President of the Board and Mr. Dent, Clerk. The town existed but three years under this organization, a city charter being obtained March 7, 1867. The election was held October 7, when Dr. Jno. Stoner was elected Mayor and the following Aldermen were selected: Samuel Work, H. R. Kipp, John Sparks, and Henry C. Dent and Clerk M. L. Newell. At an election held September 20, 1872, it was decided to incorporate under the general act. On April 15, following, C. H. Whittaker was elected Mayor. Minonk of today is the largest place in our county and one of the most progressive towns in Illinois. Since the first settlement, where the growth has been slow, but steady and substantial, until at present time it is referred to with pride as a metropolis of Woodford County. The city has first-class railroad facilities, the main line of the Central with its innumerable connections, the Minonk and Kankakee division of the road and the Chicago, St. Louis & Western. The building of the Central railroad proper anti-dates the history of the town. The C. St. L. & W. was completed in 1872. The township voted $50,000 to this road January 16, 1869. The Kankakee was built in 1873 and Minonk is the western terminus. (The blank appeared in original story as the authors evidently did not know the date). The Central Company has just completed a fine depot building here and Minonk has one of the best on the line of the road. Minonk is well supplied with churches, the following denominations being represented there at present: Presbyterian, Methodist, Baptist, Christian, Catholic, Lutheran, German Baptist, Advent and African Baptist. The different societies have very good buildings for holding their services and all have fair memberships. The great interest of the city and in a manner the cause of its prosperity is the extensive coal mining carried on there. The coal is of a superior grade and a ready mined. Over 500 men are employed in and about the mine and in the tile factory operated by the same company. The coal company was incorporated in 1869, and work commenced on sinking a shaft. A vein was struck at a depth of 314 feet below the surface. This vein was not considered a very good quality and boring continued when another vein was struck at an additional depth of 239 feet below the surface. This is the seam now being worked so successfully, the average amount of coal being raised daily is about 500 tons. The City Officials today are: Mayor, E. A. Wilcox; Alderman: first ward, N. L. Davison and Joe Stoneman; second ward, E. A. Ewen and C. S. Fuller; third ward, J. E. Sangster, J. W. Shepherd; City Attorney, Thos. J. Kennedy; City Treasurer, Chas. M. Golden; Fire Marshal, H. A. Christians, Jr.; Superintendent of Streets, A. Brock; City Marshal, Jacob C. Wickler; Night Patrolman, Dennis Ryan; Police Magistrate, J. M. Mingers. The township officials today are: Supervisor, Josiah Kerrick; Collector, John Farrell; Assessor, J. Henkell; Clerk, Jas. E. Owens; Justices of the Peace, Alfred Rogers, C. A. Cutler, George U. Simpson; Commissioners of Highways, C. E. Webber, Jas. Ridge, Richard Spires; School Trustees, Alfred Rogers, R. Spires, Ed. Goodwin; and School Treasurer, Ed. Goodwin. The public school system of Minonk, though under one principal, is, and has been for years divided into two parts known as the East Side and West Side schools. Oak Street is the present boundary between them. The East Side schoolhouse is situated two blocks east and the West Side one block north and three west of the Illinois Central depot. The former is a two-story frame building, containing five recitation rooms, some cloak closets, etc. It is surrounded by a fair sized playground having a good well and cistern; the fluids quench alike the governors and governed. The teachers are as follows: Prof. L. E. Dougherty, superintendent; Miss Dora Straight, assistant superintendent; Mrs. J. Goodrich, grammar room; L. K. Fuller, intermediate department; Miss Flora Work, secondary; and Miss Anna Meachem, primary department. The West Side building is also a frame building two stories high with but two recitation rooms. The playground here is quite small and well set with trees. The instructors here are J. C. Lindsay, intermediate department, and Mrs. Loucks, primary department. In consequence of insufficient room in this building, Miss Lizzie Thompson occupies the building known as the "Old German church," with the secondary department. The report of the different departments of the Minonk schools in year 1885-86, showed 393 students, divided as follows: High school, 56; grammar, 32; East intermediate 45; West intermediate, 48; East secondary, 41; West secondary, 41; East primary, 51; West primary, 59. Among other things very essential towards making up of a first class town is a first-class fire department, one which this city can well say, we have and proud we are for being able to make use of such an expression. The fire extinguishing corps is divided into three branches. Department A, comprises 22 efficient members who manage the chemical engine; also a large mounted force pump. Department B consists of 21 members who manipulate the hood and ladder and truck, pike poles, etc., and third but not least come the juvenile firefighters, eight in number, who are always on hand and in a great many instances are the first on the ground. The following are it officers: Captain, Bartley Guishen; Secretary, J. T. Taylor; Treasurer, D. H. Perry. The Minonk library association made its debut on September 6, 1879, starting with 20 members and a collection of books that numbered 100. M. A. Cushing was the first presiding officer, and George W. Wylie, scribe. At the present, 500 volumes by the standard authors adorn its catalogue, and its membership counts more than 100. The following are its present officials: president, M. A. Cushing; vice president, B. M. Stoddard; treasurer, Jas. H. Simpson; secretary, C. S. Kidder; librarian, W. R. Dunn. The Minonk opera house was built in 1872, by Louis Lichtenstein, occupies a central position in the most prominent block in the city, and is well equipped with scenery and stage fixtures. The lower story Louie uses as a clothing store. The skating rink was built in the fall of 1883, and was opened as a popular resort a few weeks later. The edifice measures 32 x 90 feet, and is a most perfect building for the purpose for which it was designed. It was built and controlled by a stock, who are now canvassing the advisability of remodeling it into a hall in which a stage and seats are to be placed for the use of theatres, concerts and other amusements of the kind. Dances are sometimes held in what is known as the old City Hall. While our city has been in the van of almost every particular, one thing, in the shape of a public resort had been sadly overlooked until the present board seeing the great need of a park, purchased a block in the west part of town last summer, for the sum of $800. Work on the improvement will at once begin and we can hope to see a beautiful resort made of it. A. H. Danforth, Samuel Work and J. B. Reeder organized the first Sabbath school in the city in 1856. The first meetings were held in the Illinois Central passenger depot, but were soon removed to the Presbyterian Church. The wife of ex-alderman Pope is the oldest resident in our city at the present time having resided here over 30 years.